In 2012, Minneapolis-St. Paul International Airport (MSP) was the 17th busiest airport in North America with nearly 430,000 takeoffs and landings and more than 33 million travelling passengers. It serves 14 scheduled air carriers, including major hub operations for Delta Airlines, as well as other freight, charter, and corporate carriers. In addition, several United States armed forces units are located at MSP (U.S. Air Force Reserve, U.S. Marine Corps Air Reserve Training Detachment, U.S. Naval Air Reserve, and U.S. Air National Guard). A major international hub airport serves as the fueling location for hundreds of aircraft, as well as ground service equipment and maintenance fleets. This activity presents the potential for small fuel spills at any time, and occasionally larger leaks or spills. 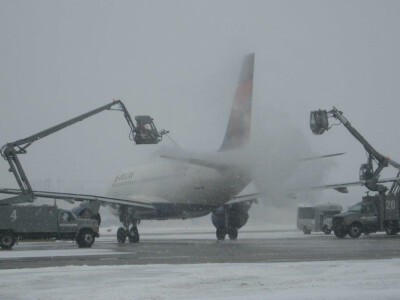 In addition, aircraft require aircraft deicing fluid (ADF, predominantly in the form of propylene glycol) during winter icing conditions. ADF is sprayed onto aircraft to melt snow and ice and prevent its buildup prior to, and during, takeoff. The fluid is designed to shear off the aircraft during takeoff. As such, fuel and ADF are the primary contaminants encountered at airports. Systems are in place to control these contaminants in stormwater. However, contaminants can seep into soils as a result of pavement crowning, through cracks and joints, or via air dispersion off pavements. Construction and maintenance activities are underway at MSP every day. Historically, capital expenditures have often exceeded $100 million/year. Dozens of major projects may be under construction at once, and impacted soil may be encountered on any one of them. Soil conditions can be particularly challenging for projects near terminal gates, deicing locations, or fuel or ADF transfer locations. 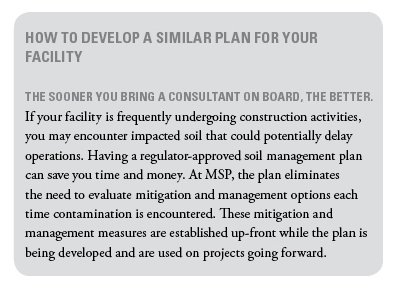 Prior to implementation of the MSP Soil Management Plan, the Metropolitan Airports Commission (MAC) had to report impacted and contaminated soil to the Minnesota Pollution Control Agency (MPCA) as a release, and work with the agency to determine corrective response. This could cause costly construction delays despite rapid response and coordination among all parties. Liesch Associates, a Terracon Company, worked closely with the MAC and the MPCA to develop the MSP Soil Management Plan. Under the MPCA-approved plan, impacted and contaminated soil is managed in real time without regulatory review. Impacted soil has lower contaminant levels, and can be re-used on site under specific conditions (separation from groundwater, foundations, etc.). Contaminated soil has higher contaminant levels, and must be disposed of in a landfill or through thermal treatment. The determination of contaminant level is made in the field using photo-ionization detectors (PIDs) and “sheen tests.” The material may be re-used or shipped off-site for disposal based on these tests. An annual summary report documents all construction projects that relied on the plan to manage soil, including project descriptions, maps, location of impacted and contaminated soil encountered, volumes of each, and where/how it was re-used/disposed. Disposal site receipts and analytical data (if any) are retained for future records. The summary report also provides the MPCA with a Gantt (bar) chart of projects for the coming year, any known releases in the area, and any environmental information learned from geotechnical investigations during project planning. The plan is incorporated into airport development project specifications, and allows the MAC to redevelop impacted areas without delays when encountering contaminated soils. Since its implementation, more than 250,000 cubic yards of soil have been managed under the plan on dozens of construction projects. Delays on construction projects at terminal gates, taxiways, runways, and other airside operational areas are extremely costly to airlines and other airport users. Savings from eliminating potential delays can be estimated to be millions of dollars (1), making liquidated damages on construction contracts (which can reach $25,000/day) seem small. Although this program was implemented for a large international airport, a similar approach could be used at other major installations where impacted soils may be routinely encountered and delays due to managing them is unacceptable. Developing a soil management plan with a consultant such as Terracon can streamline the regulatory review and approval process and eliminate construction or operational delays.